In March 2015, Descender #1 launched as writer Jeff Lemire and artist Dustin Nguyen introduced Tim-21, a lovable, optimistic companion robot thrust into a hostile cosmos. Throughout the course of 32 issues, Tim would discover that he's the missing link between a fleet of life-annihilating constructs and modern robotics. The creative team used that premise to span worlds and millennia, diagramming a volatile sci-fi opera that pits man against machine. Descender concluded last July, but Lemire and Nguyen are far from finished with their transcendental odyssey. 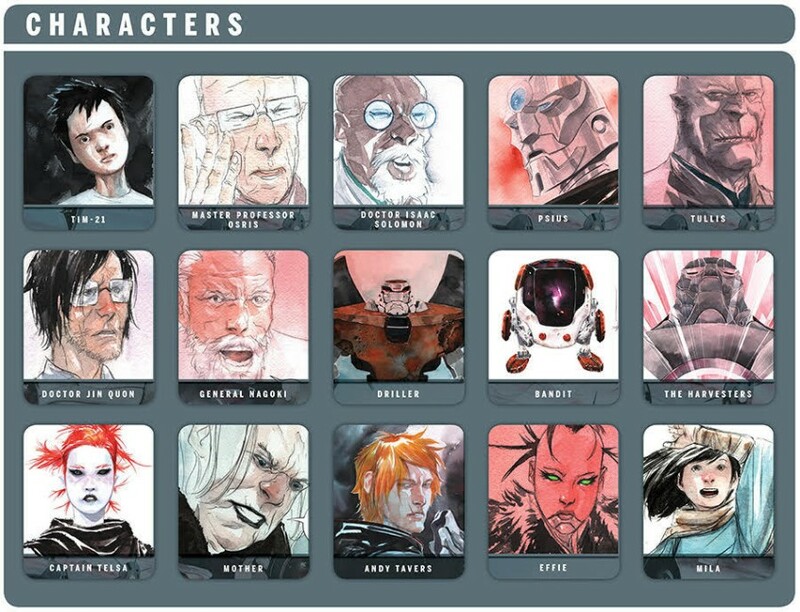 The upcoming series Ascender carries over a handful of recognizable characters from Descender and introduces many, many new ones. But while being a direct continuation of its preceding comic, Ascender also shifts genres, pivoting from sci-fi to fantasy as one girl discovers a world robbed of technology and infused with mystic wonder. The following timeline offers a step-by-step description of the events that lead to Ascender #1. Ascender #1 by Jeff Lemire and Dustin Nguyen debuts on April 24th in comic shops.